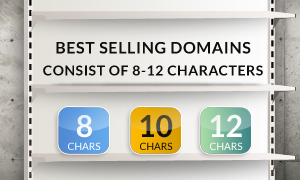 Based on recent statistics, the domain names consisting of 8-12 characters appear to be sold most frequently (on average 60% of sales), with the 9-character length being the most popular choice. Those do not include numeric domain names. Among the most frequently sold names, there are 2-word phrases within the .com extension sold at an average price of $22,000. At the same time, 4-letter domain names have the highest average selling price of $30,000. Interestingly, data shows that 4-letter and 15-letter domain names tend to be equally popular while 23-letter domains have the lowest average price of $3,000. Geographic or local domains, which are growing in popularity, constitute about 38% of domain sales and beat the top 5 categories that include: home & garden, travel, lifestyle, business & finance, as well as health (27% of domain sales). Numerics make up for about 28% of domains sold while hyphenated domains comprise just over 4%. Select names sell at an average price of $75,000 and constitute about 6% of domain sales. The most popular domain categories include technology, business & finance, and travel. With the introduction of new gTLDs, Internet users can enjoy more flexibility when choosing a domain name to fit their needs. Furthermore, numerics as well as IDNs open doors to more versatility online and help to reach a target audience more effectively. If you wish to register that perfect domain, please feel free to browse the wide array of domains we have on offer. You can check the name availability by typing it in the search tool. If you need assistance, our Support Team can be reached at support@web-solutions.eu.